Mele Kalikimaka (MEH-lay kah-LEE-kee-MAH-kah) is the Hawaiian way to express Merry Christmas. The Polynesian language is a very beautiful (and often humorous) language appropriate for such a unique place. Our pre-Christmas one-week visit to the "Big Island" with Rebecca's family was based in a quiet Kohala town called Puako where Rebecca's father and sister did an excellent job sourcing a house for eight people near the best beaches on the island. Since our visit was also a family trip our cycling mileage was quite low but we did cycle every day! 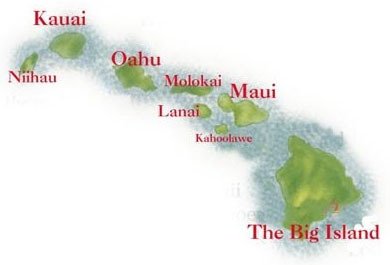 The "Big Island" is a fascinating and diverse place. Its two biggest volcanoes Mauna Kea and Mauna Loa (our biking report) split the island down the center and are a major reason why the island has 11 of the Earth's 13 climate zones. 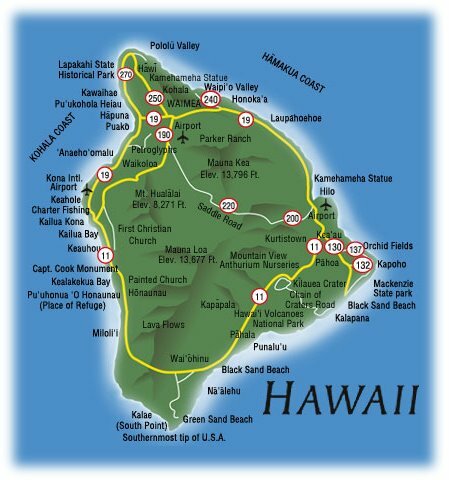 It really is a big island spanning 95 miles from north to south and 80 miles east to west making it twice as big as the combined size of the six other Hawaiian Islands. Here's a quick tour of the four sides in a few sentences: The Kohala district to the north has hiking trails along 600 foot waterfalls and 1000 foot sea climbs. The lush tropical east (windward) side receives 270 inches of rain compared to just 10 inches on the desert-like west side where you'll find the islands best beaches. To the south is the world's most active volcano, Kilauea (our biking report) which gives Hawaii the distinction of being the only U.S. state that literally grows. 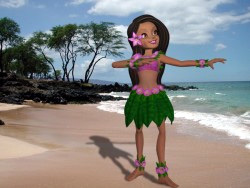 For more interesting facts about Hawai'i, the Big Island, check out this site. If you're planning a visit, I strongly recommend Hawaii: The Big Island Revealed . It's the best travel guide I've ever read and it might be too good in fact. The locals and the national park are not thrilled with its level of detail especially the directions to remote spots that cut across private property. The irony of a good travel guide is that it's popularity will eventually ruin the experience for it's readers. After a clear view of neigboring Maui and its biggest volcano, Haleakala, from the air, we landed at Kona International Airport, which based on its size must barely qualify as an international airport. It's the right size and well-suited for a tropical airport -- completely outdoors and the airport staff is super friendly making for an unusually enjoyable airport experience. We brought our handy, fits almost any car trunk bike rack and it installed perfectly on our rental Ford Focus hatchback. After 45 minutes at Hertz, we drove south to Kailua on HI-19, a road used for the Hawaiian Ironman bike route. It's a busy road with a shoulder the width of a car lane. Based on the traffic, my guess is that extra-wide bike lane will become another car lane some day. 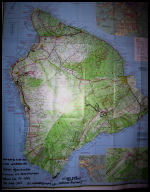 Before checking into our hotel we stopped at Bikeworks bike shop in Kona to pick up a decent Hawaii map and to get their opinion on recommended routes. With the sun about to set on our arrival day and the heavy traffic around Kailua-Kona, it made sense to drive south to Captain Cook and do a recommended short ride in Napo'opo'o region. 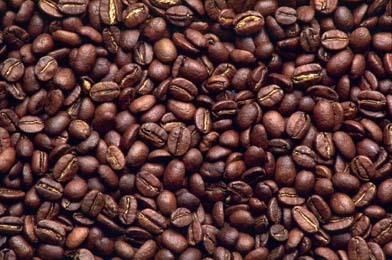 Napoopoo is to coffee what the Napa Valley is to wine. It's a beautiful, lush, tropical area off the beaten path and along the coast. We descended past coffee farms/mills, a botanical garden and an old "painted" church with the din of exotic birds filling our ears more than the usual sound of rushing wind. It was getting dark so the only picture we could afford to take was at the end of the descent on the beaches of Pu'uhonua o Honaunau National Historical Park. There was no time to find out what made it so historic but it was beautiful and looked like a great place to pitch a tent for those who like beach camping. It turns out it was formerly known as The City of Refuge where "Hawaiians who broke a kapu or one of the ancient laws against the gods could avoid certain death by fleeing to this place of refuge or pu`uhonua." From the park, we headed north along the Kona Coast while the sun fell off the edge of the vast Pacific Ocean and by the time we started the 1500' climb from the coast back to our car it was definitely dusk. I meant to bring a light but oops! Anyway, there was very little traffic and the darkness gave us the unexpected chance to admire the local display of Christmas lights. A fun ride with many landmarks for such a short ride. The highway in this area, Hwy 11, is very busy and twisty with no useable shoulder and it can't avoided if you cycle to Captain Cook so I recommend driving to start of this ride like we did. But unlike us, take your time and enjoy the landmarks and consider doing it in both directions to make it a 30 mile ride. Before leaving our Kona hotel and driving north along the coast to meet up with Rebecca's family at the rental house in Puako, we did a short really steep ride starting from the hotel. We cycled out of Kona on HI-190, a well-paved road with a small shoulder and very, very busy. We were relieved to turn off onto Kaloko Road some 6 miles later. For the next 6 miles we struggled up steep stretches. The Hawaiian road designers built sadistic switchbacks that became steeper on every turn. We encountered many 19% sections. And what was the reward at the top? Nothing but an entrance to a golf course! The road is an un-scenic grind, which you can leave off your list of Big Island rides.